Cleanliness is a big part of your business. Make your showrooms, repair centers and shops clean and inviting. When customers enter your automotive facility, the first impression is important, and cleanliness is an absolute must. 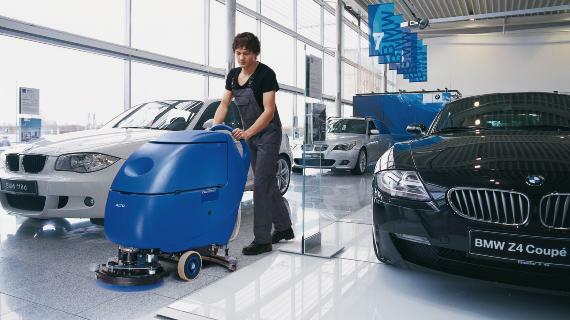 From indoor to outdoor areas – Nilfisk can offer you the perfect solutions for both interior and exterior cleaning of cars, showrooms, repair centers and shops, so you can keep your focus on your customers. Vehicles are easier to sell in a nice and clean environment where showroom floors are clean and shiny. And customers don’t just judge you on your showroom: they also experience repair centers, where accumulated stubborn, greasy dirt requires powerful cleaning solutions. Nilfisk offers cleaning products that make your everyday cleaning requirements a breeze – from effective pressure washers to sweepers and high performing scrubbers. Nilfisk has a wide range of accessories for easy and efficient vehicle cleaning, including wash and rotary brushes, under carriage washers and curved lances. Nilfisk cleaning equipment is designed to make your facilities more sanitary and your cleaning practices more productive. Our environmentally-sound cleaning solutions improve cleanliness with fewer chemicals and less labor, significantly improve staff comfort, and deliver a better overall experience within the automotive industry.